Pomegranates, Tesselations, and Washington Irving. 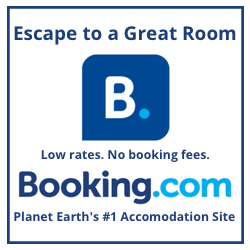 Our hotel managed to secure a pair of adult admission tickets to the Alhambra (a UNESCO World Heritage Site, inscribed as Alhambra, Generalife and Albayzín, Granada), a fortress that stands on a hill high above the city of Granada. Alhambra means "red castle" in Arabic, and the place dates back to the 12th century when the area was ruled by Moorish emirs. The number of tickets issued to visit the Alhambra each day are limited, so they recommend you buy your tickets to in advance. However, they also have a certain number of walk-up tickets available each day, but the line to get these is pretty long and the tickets go quickly. And since it was Semana Sanata, the place promised to be busier than usual. So while we had our adult tickets already, the kids' tickets (which are free—hooray! ), had to be picked up at the ticket window. Our appointment for the Palacios Nazaries was at 9:30 a.m., and it took at least 15 minutes (we were told) to walk from the ticket gate to the palace entrance). If you miss your time slot, they won't let you in to the palace, so we wanted to get our tickets by 9:00 a.m. to hedge our bets. So that's why we headed off at early morning hour of 8:00 a.m.
Clean streets the morning after a parade in Granada. The first thing we noticed about Granada the morning after Maundy Thurday parade we'd witnessed the night before was just how clean the streets were. I mean, they were spotless. Also, there was no one in sight. We wanted to get something to eat before hitting the Alhambra, which we suspected would be at least a two-hour adventure. But Spain is a sleep in late sort of country, and we were having trouble finding anything that was open. Fortunately, on the road up to the Alhabmra we managed to find one small place, manned by one sleepy gent who looked like he just fell out of bed, that had just opened. Puerta de las Granadas (Gate of the Pomegranates). Fun fact! The Spanish word for pomegranate is granada, and so it should be no surprise that the pomegranate is a symbol of Granada. And so it was no surprise to us that the first gateway to the Alhambra complex known as the Puerta de las Granadas. Shortly after we cleared the Gate of the Pomegranates, we came to a bronze statue of Washington Irving, best known in the United States for writing "The Legend of Sleepy Hollow." But what was he doing here? 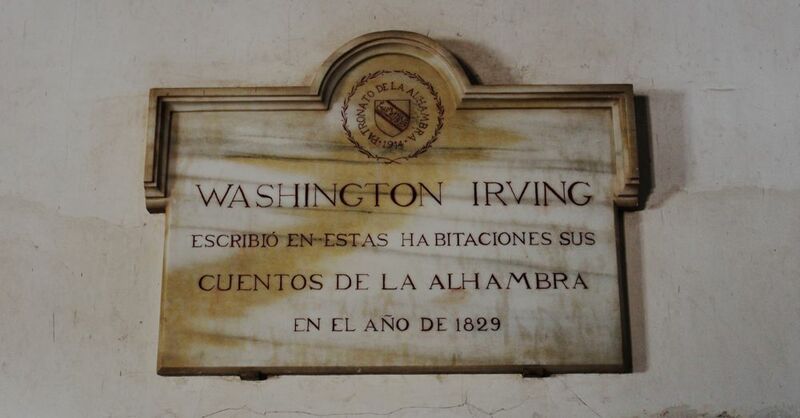 Washington Irving, son of the Alhambra. Even more puzzling is the inscription at the base of the statue that reads "hijo de la Alhambra" (son of the Alhambra). What is that about? 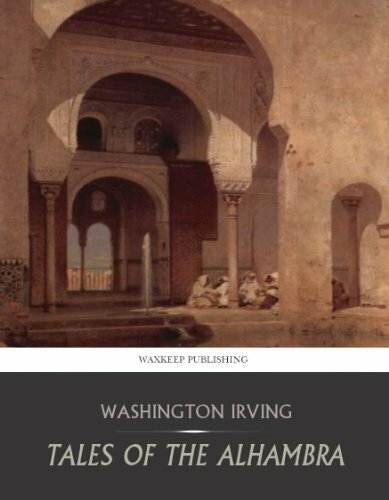 As we later learned, back when Irving visited Spain, he was granted access to the Alhambra that inspired him to write Tales of the Alhambra, published in 1832. Fun fact! Alhambra, California, just a short distance from our home base of Los Angeles, was named for Irving's book. by Washington Irving, combining description, myth and narrations of real historical events. Washington Irving wrote in these rooms his Tales of the Alhambra in the year 1829. We strolled right on by, though. We were hoofing it to the ticket office. On the way there we encountered our first gypsy ladies handing out sprigs of rosemary. All the guidebooks and the guides warn you about gypsies, especially the rosemary vendors. If you're unfortunate enough to take a spring of rosemary they give you (for luck), they will demand payment. And they don't like coins, so that rosemary sprig will cost you at least 5€. After we fell for a street scam in Hanoi, we recognized this scam for what it was and avoided these ladies. The Alhambra is actually a series of buildings: the Palacios Nazaries (what most people think of when they think of the Alhambra), the Palace of Charles V, the Alcazaba (what most pictures of the Alhambra show), and the Palacio Generalife. There's also a cathedral in the mix. Once we had our tickets, we walked straight toward the Palacio Nazaries. We had plenty of time to make our 9:30 a.m. appointment time, so we stopped for a quick restroom break and took a moment to check our the huge rectangular block that is the Palace of Charles V.
When Los Reyes Católicos (that's Ferdinand and Isabella) took Granada back from the Moors in 1492, they took the Alhambra, too. Then in 1527, Charles V, Holy Roman Emperor built a new palace here next to the Moorish palace which he named the Palace of Charles V (as any good monarch does). Its high renaissance-style appearance makes it stand out from the Moorish construction. 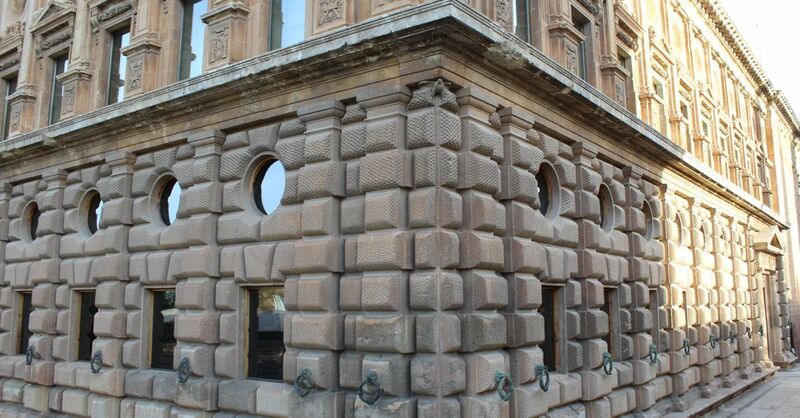 One notable feature of the Palace's exterior walls are the bronze rings hanging along the sides and on the corners. Interestingly, the rings on the corners are held in the beaks of birds while all the other rings hang from a lion's mouth. 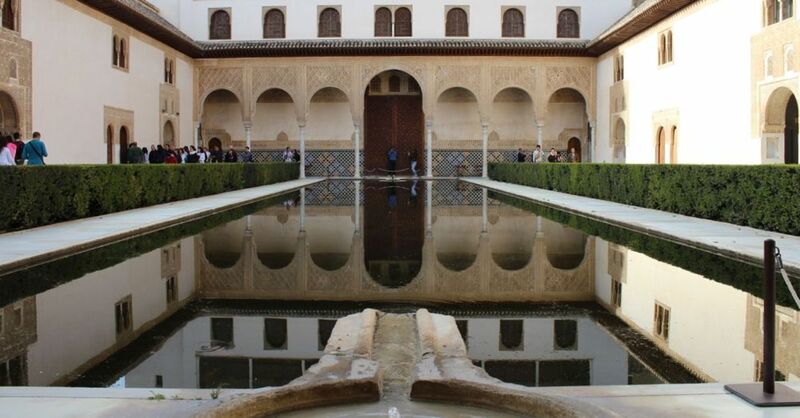 As of the mid 14th century, it was the royal palace of the Islamic Sultans that ruled Granada. This is an amazing building. Every wall is covered with intricate decoration. Sometimes this is exquisitely carved designs, other times a long poem in Arabic script stretches around the room, and then there are the amazingly detailed inlaid, tessellated tiles. It's said that these tessellations inspired the work of M.C, Escher from when he visited the place in 1922. The pool-filled Court of the Myrtles. Also called the Patio of the Pond or the Patio of the Reservoir, for obvious reasons. There is evidence of kitchens on the southern side, but part of the adjoining wall was destroyed to make room for the Palace of Charles V.
One of the most famous images from the Alhambra, this patio is named after the fountain that features a 12-sided bowl on the backs of by 12 lions. It stands in front of the Palace of the Lions and, with doorways and halls on each side of the patio, is very central to the rest of the palace. A view fit for a Sultan. 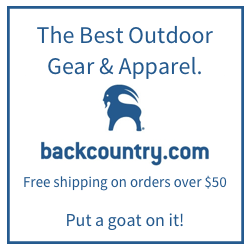 There's no real story behind this, other than it's pretty amazing. And while it's been restored, writings have of the time do reference at least one other stained glass ceiling that was built in the palace. I think this was was in or near the Hall of the Two Sisters. Ceiling in the Hall of the Two Sisters. Despite some of the stories that are told, this room is not named not for any human sisters but rather because of two matching flagstones set in the floor. The ceiling is particularly impressive. Circumcision is cause for ceremony in Islamic culture, and these Sultans, as we learned in Istanbul, threw lavish parties when the time came to remove their sons' foreskins. In this room most of a poem by Ibn Zamrak that as written to celebrate the circumcision of Prince Abd Allah is inscribed on the walls. An inscription fit for a circumcision. There's a lot more to see inside the walls of the Palacios Nazaries. 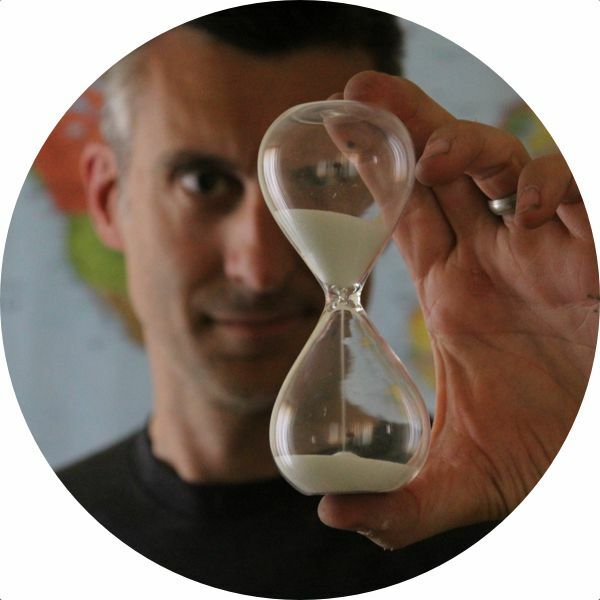 By the time we were finished, two hours had gone by, and there were even a few things we had missed. For instance, the baths were closed for renovations so we sadly didn't get to see them. After we left the Palace we walked through the Gate of Wine and into the Alcazaba. Puerta del Vino (with the Alcazaba in the background). The Judas tree in front of the Alcazaba. After leaving the palace, we headed right over to the Alcazaba, which is the westernmost fortified part of the Alhambra. 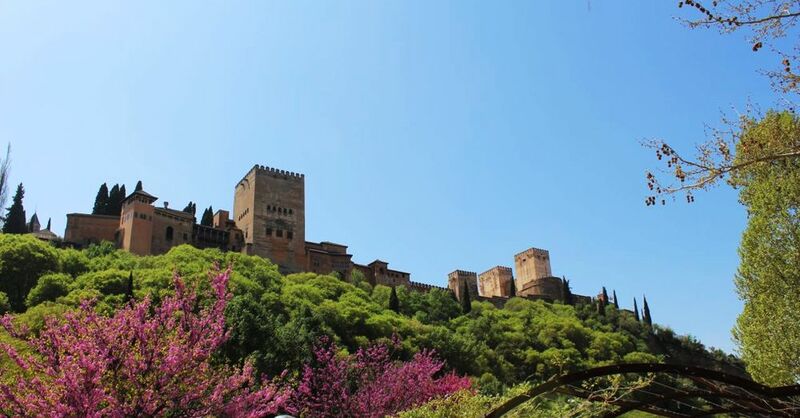 The route through the Alcazaba is, compared to the Palacios Nazaries, quite short and leads right up one of the most recognizable features of the Alhambra is the Torre de la Vela, also known as the Watch Tower. 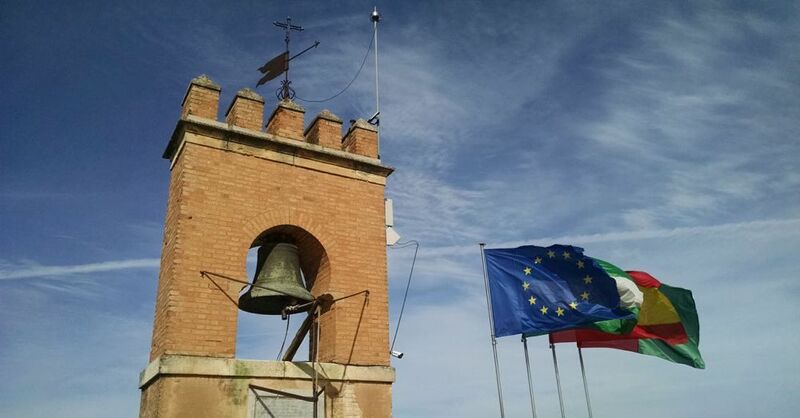 The top of the Alcazaba Watch Tower. From the top of the Watch Tower you can see all around Granada to the snow-covered Sierra Nevada in the distance. And looking a little closer to home, we could even see our hotel room far below us. Our hotel room from the top of the Watch Tower. On the way up to the top of the Watch Tower, we had to walk through the old army barracks, which were pretty cool. But it wasn't until the way down that we got a really good view of how they were laid out. The barracks at the Alcazaba from the Watch Tower. We took a quick spin through the Palace of Charles V but, aside from the gift shop and a museum, there's not much going on here. The central circular court is pretty cool, though. We made our way toward the exit. Our time was running out—we had to be out of the complex by 2:00 p.m. according to our tickets—and we had just enough time to take a quick trip through the Palacio de Generalife. Patio of the Irrigation Ditch. Also known as the Architect's Garden, this was where the last dynasty of the Spanish Muslim Sultans spent their summers. The current gardens, however, date back to 1931. They're quite beautiful complete with hedgerow mazes and elaborate irrigation systems running throughout the complex. There are also some amazing views of the entire Alhambra complex and the town of Granada behind it. Orange tree over Granada, Generalife. After that we came back down to another busy Granada afternoon. It was so busy, and there were more parades planned for the evening, so we decided to not even try to move the car. Instead we took a little siesta and then braved the parade crowds to check out the free tapas scene. We're happy to report back that the free tapas scene is fantastic, especially at La Antiqualla II.